Lifelong New Orleans resident Kit Wohl knows better than most the pride Crescent City locals take in their food, including Shrimp Creole. Now on the eighth title in her Classic New Orleans cookbook series, the award-winning author carries on her tradition of providing readers an authentic taste of Creole cuisine with New Orleans Classic Creole Recipes (Pelican Publishing, 2014). 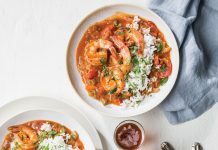 The book explores the celebrated history and recipes of the Crescent City, featuring an array of New Orleans classics like Red Beans and Rice, Shrimp Creole, and Beignets. Top chefs from local institutions including Galatoire’s, Antoine’s, Commander’s Palace, Dooky Chase’s, and more have provided exceptional tips and techniques, with recipes that have been reinterpreted for ease of preparation by the home cook. 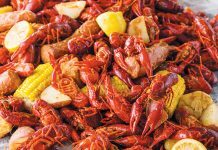 Sprinkled with bits of history, culinary know-how, and local folklore, New Orleans Classic Creole Recipes is a gold mine for any connoisseur of Creole cuisine. In a large heavy saucepan over medium-low heat, add oil; stir in flour, stirring constantly until a peanut butter-colored roux forms. Reduce heat to low and add onion, garlic, green onion, and bell pepper. Stir well, and cook until softened, 4 to 6 minutes. Stir in tomato sauce, thyme, bay leaves, oregano, and lemon juice. Increase heat to medium, and bring sauce to a simmer. Add 2½ cups water, cayenne, and salt, and simmer until thickened, 30 to 45 minutes. 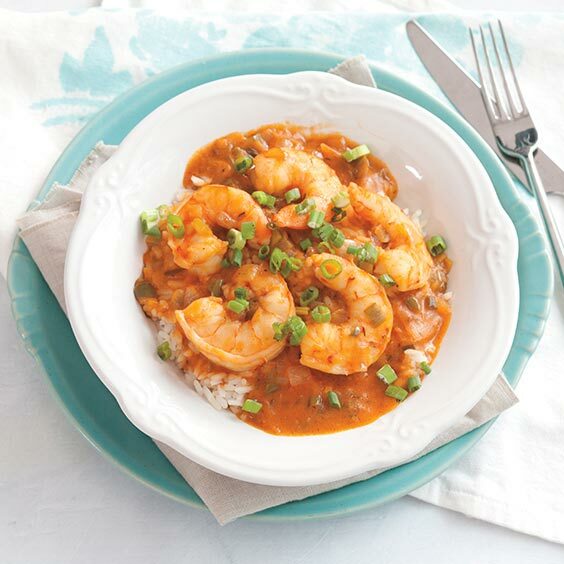 Gently stir in shrimp, reduce heat to a gentle simmer, and cook, covered, about 20 minutes. Let stand 10 minutes more. Remove and discard bay leaves. Serve over rice with green onion, if desired. Sounds wonderful, but is all that salt really necessary? I’m only concerned as I have high blood pressure. If you’re concerned about your salt intake, you could leave out the salt while cooking, and add it to taste at the end. That will give you more control over the overall amount of salt. IF you cannot have salt, then use Tony’s salt free seasoning. It has all the kick. Also, Sea Salt is better for us anyway. Try that. For lower salt, use 1/4 teaspoon in cooking and sprinklele serving with a tiny pinch of finishing salt. The small amount in the cooking is just enough to take the edge off the sauce. That on top reads as salty on the tongue. I added paprika a bit more lemon juice and black pepper. It was excellent! Will definitely make again. Sound good plan on cooking me using some Louisiana shrimp…. looking at Chef Wayne Baquet’s made me smile at his last name I’m was raise 45 miles from NewOrleans maiden name Boquet…. I was blown away by the amount of oil, but if the serving is for four then 1/4 c per person. I’ll make this by the original recipe the first time. This looks fabulous! At face value, it looks like a lot of oil (and it is), but that is what it takes to make the roux. The only thing I’d like to know is how many carbs would be in the serving? Asking as a diabetic that controls diabetes through diet and excersize. An off-the-cuff estimate from myfitnesspal.com suggests that the carbs per serving would be about 55 grams. We didn’t call for a specific amount of white rice per serving in the recipe, but for the purposes of this estimate, that number includes 1/2 cup cooked white rice. I would substitute chicken broth for the water. Looks like a good recipe. I will definitely try it. Yes! I do that and 1/2 a whole lemon and a few tablespoons of vinegar! Allow it to cook down and it is freaking amazing!! Also, sprinkle in some Old Bay!!!! I am eating it right now and every single taste buds I own is going crazy! I forget, I use tomato juice instead of sauce! More tart but better! 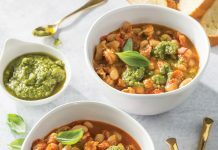 Love your recipe with so many herbs and spices!